Some kids like to read books about soft, cuddly bunnies, other like to read about beings with fantastical super powers and other kids, they like to read about creepy things. They want to be scared when something goes bump in the night when they are awake reading long after their parents told them to go to sleep. 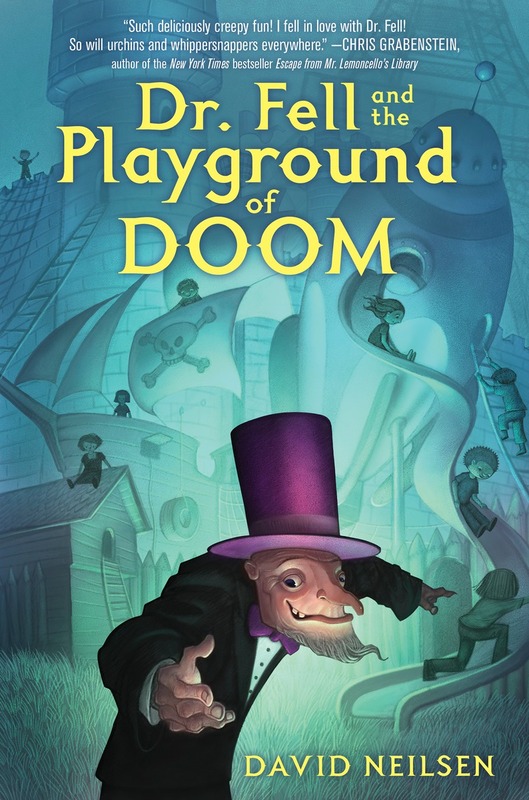 Those are the kids that want to be reading Dr. Fell and the Playground of DOOM. Like Nancy, Gail and her brother Jerry, they will just know that something about Dr. Fell is not quite right. From the way his purple hat seems to shade, or is it protect, him from all the sunlight. Or is it that overnight he built a wondrous playground in his yard for all the neighbouring children to play in and upon with no concern that those children are getting hurt, repeatedly. Even the parents don't seem concerns that their children are getting injured as they know that Dr. Fell will take care of them. From the moment they meet Dr. Fell, he appears somewhat sinister to the children. He is dressed all in black, except for his large purple hat, and he is all bent over and he creaks as he moves. Added to that, he speaks in a very formal, almost old fashion form of speech. The entire neighbourhood is set to dislike him as he has bought the abandoned house that has served as their playground for a generation. Within days, all has changed and suddenly everyone is talking praise of Dr. Fell's playground and how nice he is. How creepy can that be. The three friends are the only people left in town to question what has happened. This starts out as a fun book with comical last names for the children and outlandish street names. They more these are repeated, the funnier they seem, sort of like repeating a tongue twister until it becomes totally garbled. This is a good balance for the creepiness that ensues. For me, one of the creepier things is that he keeps calling the children urchins. Obviously he does not really like children, but why then did he build them such a wonderful playground. Jerry, Nancy and Gail are inquisitive children. They draw on what they have learned to try and find a way to stop Dr. Fell. I enjoyed the way they worked together and shared their ideas. They found a way to put their differences aside in order to help their community. I read most of the book in one sitting and stayed up way too late to finish it. I could imagine a younger reader cuddling underneath blankets with a flashlight to evade parents checking that the lights were out, wanting to read just one more chapter. This is a fun and creepy book that should appeal to a wide range of readers. Several follow-up activities came to mind as I finished reading. On Thursday I will publish a guest post with author David Neilsen. I hope you'll join me then and learn more from this up and coming author. 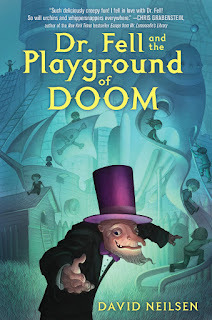 I received a review copy of this book from Random House Kids and author David Neilsen in exchange for an honest review.